Giovanni Varenna is a cozy independent house located on the beautiful Lake Como. The house sits on its own sizable property of 500 square meters and shares a 60-acre estate with Rossa Varenna, Piccola Varenna and Vista Varenna. The other holiday rental houses are on elevated ground near Giovanni Varenna and cannot be seen from the house. The house includes many modern conveniences and has direct access to the new shared pool from the gated garden. In 2017, the pool will be open from May 20 to September 23. Pool towels are provided. Giovanni has pleasant views of the historical castle belonging to the property, but does not have direct lake views. Guests are encouraged to enjoy the benches on the estate, especially along the beautiful walk to tennis courts, to partake of the panoramic views of Lake Como. A short walk (80 meters) brings guests to a small, charming hamlet where cars are not allowed. Here, guests will find an inexpensive bar and restaurant. Giovanni’s architecture style is simple and the interior (90 square meters) has been tastefully furnished with a stylish, modern feel. The house is set entirely on one level, and is therefore appropriate for people with walking difficulties and small children. Giovanni Varenna consists of one double bedroom (one bed that cannot be separated into two twin beds), one twin bedroom (two single, joinable beds), and a bathroom with bathtub, handheld shower and hairdryer. The living room/ dining room has a CD player and satellite TV. The kitchen is equipped with a dishwasher, refrigerator, washing machine, microwave and oven. The patio is nicely furnished and includes an outdoor BBQ. WiFi Internet is available in the area of the recreation room on the estate. The lovely town of Varenna is only 3 km downhill from the property. Guests will find a variety of shops in Varenna, as well as many delicious restaurants and a pebbly beach. A railroad station is located in the town (Milan is one hour away) and there is a ferry service to other lakeside towns such as Bellagio and Menaggio (reached in 15 minutes.) Guests of Giovanni Varenna are welcome to use the tennis courts. 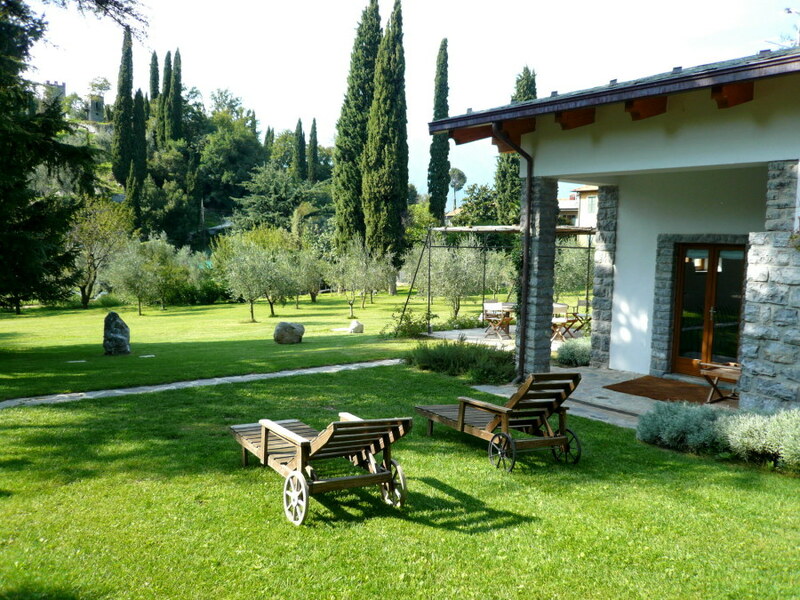 A well-behaved dog is welcome at Giovanni Varenna, only with the owner's pre-approval and it must be on leash in the garden--fee 80 Euros per week. Extra maid service can be arranged upon request. This property can be rented in combination with Rossa Varenna, Piccola Varenna and other nearby properties for larger groups. Varenna is a beautiful lakeshore town on lake Como. Built on a rocky promontory, it was a sentinel for centuries at the heart of the lake. Varenna today is a quietly refined town with charming old houses and romantic panoramas. The climate is particularly mild, as witnessed by the presence of olive and cypress trees, as well as other botanical specimens normally found in much warmer climates. Along the lakefront is a romantic walkway, abounding in lush vegetation, linking the town center and Olivedo, the landing point for ferries and steamers. Varenna is the ideal starting point for a visit to the north and central regions of Italy and the southern Swiss Alps. It is less than two hours from Milano Malpensa airport and one hour from the Milano Linate airport. Places to visit: The Castle of Vezio (only a five minute walk from the villa). The gardens of Villa Monastera, a neo-classical garden offering a long walk along the lakeshore. Bellagio and Menaggio are 15 minutes away by ferry. Como with its ancient monuments, excellent shops and churches are near the villa, as are Tremezzo and the famous Villa Carlotta. Two hours of maid service each Tuesday, Thursday and Saturday are included. Linens are changed on Saturday. Tennis courts can be reserved for 15 Euros per hour in the daytime and 20 Euros per hour in the evening. Services available only upon request and charged separately include cook services, breakfast service, cooking lesson, advance grocery shopping, baby sitting, extra maid services and restaurant reservations. Extra linens and bath towels are available--cost provided on arrival.